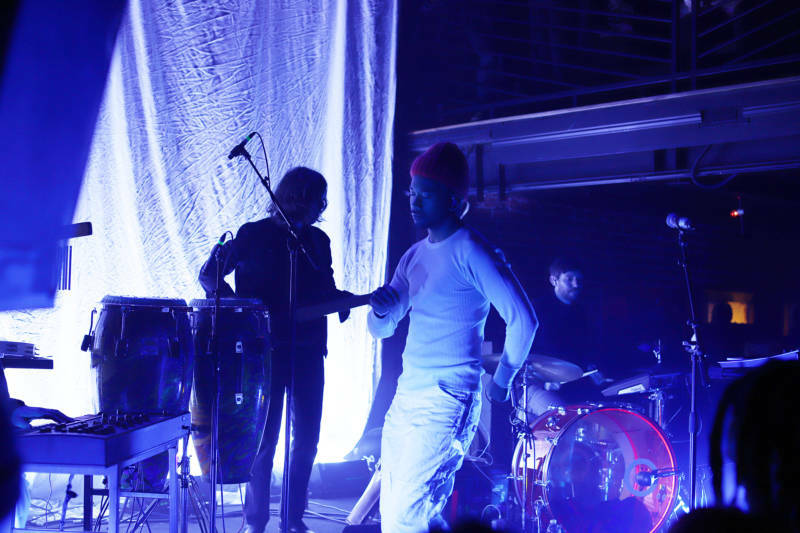 Toro y Moi has sped through the Atlantic on Diddy's speedboat, produced for Travis Scott and performed for sold-out crowds around the world. But his day-to-day life in the Bay Area isn't nearly as glamorous. Most of the time, in fact, he can be found collaborating with local artists at his warehouse on a graffiti-covered street in North Oakland—the home base of his design studio and record label, Company. But glamor isn't what the artist—real name Chaz Bear—looks for in a city. "If you look at Oakland and where it's going, I feel like it's a city for subcultural artists of color. 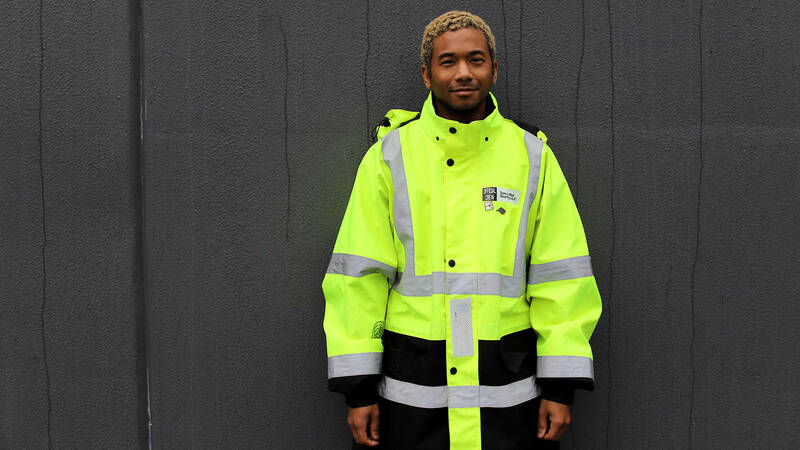 It's open-minded," he tells me on a rainy afternoon at KQED's San Francisco office, where he arrives wearing a neon-green, reflective worker's jacket screenprinted with the Company Records logo. Company's headquarters isn't far from the final freeway exit Bear takes in his 2017 one-take visual album, Boo Boo, which follows his car from San Francisco and over the Bay Bridge into Oakland. Released after Bear reached a new pinnacle of mainstream success (the Travis Scott collaboration came in 2015 for the rapper's chart-topping debut, Rodeo; the Diddy connection took root that same year, backstage at Coachella), the Boo Boo video served as metaphor, reaffirming his commitment to his adopted East Bay home while the music industry's eyes were on him. 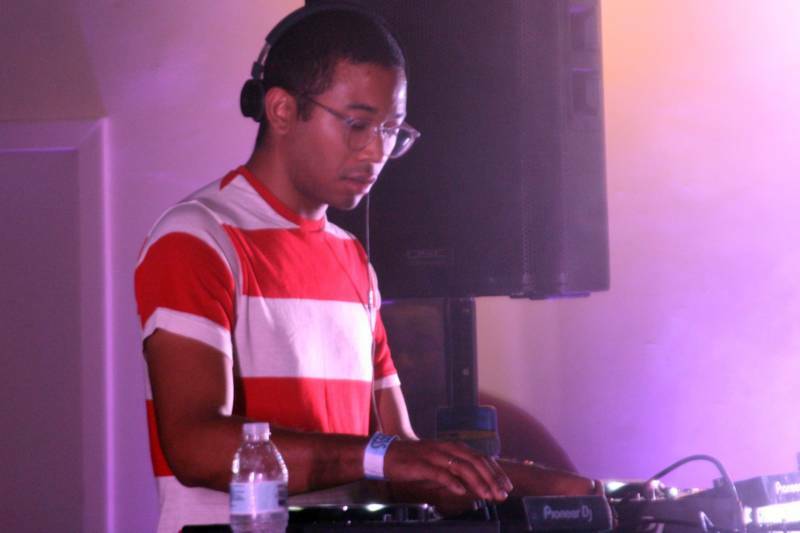 During the year and a half between the heartbreak themes of Boo Boo and his funkier, more danceable new Toro y Moi album, Outer Peace (released Jan. 18 on Carpark Records), Bear established himself as a passionate supporter of the Bay Area's creative community through collaborations with local artists. Those include diverse, interdisciplinary collectives Wine & Bowties, Shade Zine and Club Chai, all of whom have significantly shaped Oakland's visual art and nightlife scenes in the past several years. "The first show I played here was at Bottom of the Hill, and the first thing I noticed was how diverse the crowd was. The first two rows were Filipino teens," says Bear, who is Filipino and African American, with a slight build, bleached hair and a soft-spoken demeanor. "This was my first show out of South Carolina, and I was blown away. It was cool to see a city that had a diverse subculture." Bear arrived in the Bay Area in 2012, when he followed his then-girlfriend from South Carolina to her grad program at UC Berkeley. During that period, he rose in the ranks of the music blogosphere and became known as a key architect of chillwave, a fuzzed-out indie rock and electronic subgenre that continues to influence to today's pop music landscape. After moving to the Bay, Bear quickly gelled with the local scene—and his sound evolved, too. In part through various DJ gigs—including several at Wine & Bowties' homegrown mini-festival, Feels—he honed the sleek, autotuned take on funk and disco that defines Outer Peace. While Boo Boo lamented his separation from his high-school sweetheart, Outer Peace finds Bear in a productive and energized state. The album celebrates the creative hustle of self-employed artists behind their laptops; the debut single, appropriately, is called "Freelance." With creative partner Brendan Nakahara, Bear built Company's headquarters on that "Freelance" ethos of a constant grind. When we talk, he likens it to a millennial version of Andy Warhol's famed Factory, where white indie-rock dudes rub shoulders with black feminist photographers and Asian-American designers. "It's really sick to see these crews getting their foot in the door, and I feel like I'm in a position where I have to come in with the assist," he reflects. "It's almost required as a successful person—you have to give back. If you're not giving opportunities, it's kind of for the wrong reasons." As much as Bear loves Oakland, the sold-out kickoff show for his Outer Peace tour at the New Parish proved that the town loves him right back. The eager audience applauded his slightly awkward dance moves, clapping along on the two and the four of almost every track. At Company, Bear produces for several Oakland indie acts, including Tanukichan, Astronauts, etc. and Madeline Kenney. He mentors his artists on all aspects of the biz, including writing hooks, social media branding and booking shows. Unlike at a traditional label, "there's no advance, but you get my time and my ear and my eye and we'll make the best thing we can make," Bear says. "He’s good at putting people into contexts where they can then find their own voices, whether it’s producing a record or having them on for a tour," says Astronauts, etc. 's Anthony Ferraro, who is also Bear's touring keyboardist and has his own studio at Company HQ. "He’s a really good enabler. He has an intuition for that sort of thing." Though Bear bases most of his collaborations on friendship, he ultimately sees Company as a business. To hang with his crew, you can't be a purist with too many misgivings about "selling out," nor harbor too many romantic aspirations of art existing outside of the market. For example, while many in the Bay Area's creative scene bristle at mentions of the tech industry—a primary driver of gentrification and displacement in the region—Bear is quick to cite Instagram as a source of inspiration for his interdisciplinary curation at Company. "D.I.Y. is great, but we also want it to pay for itself," he says. "It's hard to make that first jump as an artist, to put yourself out there and really sell it, do the interviews and brand your image, to go from playing house shows to being at The Fillmore." For instance, Salami Rose Joe Louis, one of his opening acts for his Outer Peace tour (which kicked off Jan. 14 in Oakland), played the local house-show circuit as recently as six months ago. After they opened for Toro y Moi at The Novo, a 2,400-capacity club in Los Angeles, Bear remembers telling the band: "I'm sure you guys must be feeling crazy right now, but we're really putting Oakland on." As much as he's thrived on a D.I.Y. approach, Bear's eventual goal is to own the Company Records building and build a more permanent infrastructure that includes a staff. Basically, he's trying to implement the lessons he learned from hanging with Diddy on that boat off the Miami coast. "The knowledge I got from hanging out with artists who are bigger than me or more successful—you can't read about that sort of stuff, you just have to see it," he says. "It's fun to see how other camps work in bigger industries, and to bring that knowledge back down to the indie scene is valuable."